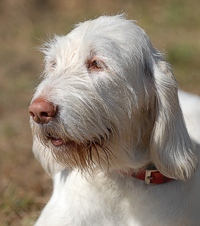 Event: Spinone Club of America - All Breed Hunt Test in Hustle, Virginia. 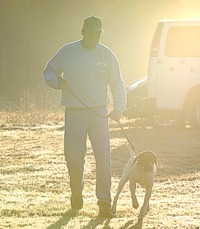 A sunny, warm April morning makes for a challenging hunt test day. Much water was poured. There's one in every crowd, isn't there? 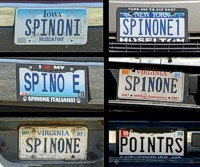 Though this event was hosted by the Spinone Club of America, it was an all-breed hunt test, so Pointers were welcome amongst the Italianos. Master braces started at 7:00AM. Which, since it turned out to be a hot day, was a good thing. There's nothing like early morning sun lighting up the field to get a sense of scale. Here, one of the first Master braces comes along the back course on their way to the bird field. Sam, a German Wirehaired Pointer, quarters the back course in front of the judges. 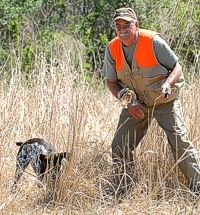 Once into the bird field, Sam quickly locks up on a quail. The two gunners are flanking the dog while handler Ed Nuzum (prop gun in hand), kicks to get the bird up. Of course, the birds don't always flush the direction you'd hope. Good for Sam, being steady as the quail breaks right past him. 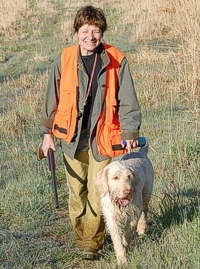 A warm Spinone and smiling handler head out of the Master bird field. Shelby, a GSP, shows his signature enthusiasm as he cuts loose on his Master run. 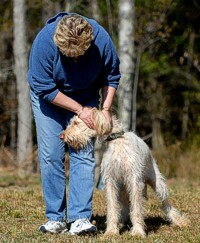 The hunt test grounds are a good socializing spot for owners and dogs alike. Much catching up and snoofling is accomplished between runs in the field. A brown-and-roan Spinone watches activity across the event grounds. You're looking at what, now? Yes, they CAN see past the hair. Really. It is worth getting up at 4:00AM on the day your GSP gets his Master Hunter title. Congratulations to Keith and Shelby - they're a great team. Yes, it certainly is bright out. This cool customer's snowy coloring is a big asset on a sunny day. A very, very civilized chain gang. Are those stake-outs even pounded in? Doesn't matter! Nope, not checking for ticks - just getting some love. The tick check comes after the run in the field. A slightly frothy Pointer turns hard while quartering in the back course. The club was nice enough to place water troughs along the way. Still plenty of bounce left after a hot pass through the bird field. A Weimaraner and a Spinone make their way in front of the handlers and judges. Two pups socializing on the sidelines. Mama mia! 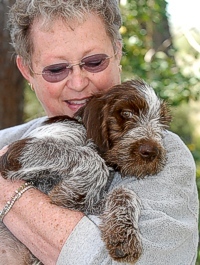 Bobbi Benson and one of her adoring pups. Never go too far from the person carrying the shotgun. There's nothing more electrifying than that instant that a pointing dog on the run whips her head around as she crosses scent. The Junior bird field. Taylor's locked on the cover where she pointed the quail, and Carl - blank gun at the ready - has kicked up the bird. Things happen fast! Hey, you - put that shaggy head back in the Jeep.